In the last 7 years, CcHUB has supported the growth of a community that is passionate about using technology to solve local problems and transform Nigeria. One of the ways we have done this is through our incubation program, where we provide startups with the resources and support they need to grow their businesses into sustainable companies that employ people and solve local problems. To date, over fifty (50) ideas have enjoyed our support at various levels through our incubation program, some of which include Lifebank, BudgIT, WeCyclers, Truppr, Mamalette, Stutern and Genii games. In our quest to continue to provide the right support, we identified areas of improvement through feedback from current and past incubatees as well as the larger community, and revamped our incubation program to produce better outcomes. The new incubation program will now run for a fixed duration of 12 months, as opposed to 18+ months. A new program plan has been designed to be more intentional about the support we give to startups with a core focus on enabling startups to gain more traction and access funding post-incubation. In addition to equity investment of up to $25,000 that startups receive during the program, our startups will get direct access to possible follow-on capital of up to $250,000 from the Growth Capital fund by CcHUB. Entrepreneurs will get hands-on support from the different practices in CcHUB to help with business strategy, financial management, digital security and recruitment. In addition, a newly created product development unit will be available to support the technical lead/team of the different startups. There will be an emphasis on growth and distribution as we have identified how challenging it can be for startups to reach their customers quickly and effectively. This will involve one-on-one sessions with experts in sales, marketing, and distribution, as well as marketing opportunities via partnerships with media platforms, companies and personalities. Over the years, CcHub has built a network of corporate partners across the globe. Startups accepted into the program would have access to this network of partners which include several benefits such as $15,000 in credit from Amazon Web Services. Other benefits of the program include: free workspace for up to 6 team members, meeting rooms and high speed internet. We would invest in and support the startups that are accepted into the program in return for 7% of the company’s equity. The 2018/19 Program is scheduled to start first week in April and applications are now officially open. 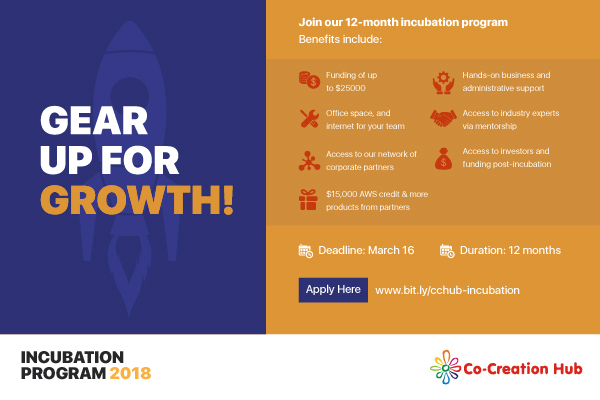 Although the deadline for submission is March 16, applications will be reviewed on an ongoing basis until all spaces are filled so startups are advised to apply early. The program is open to startup teams from anywhere in the world that are looking to grow their businesses in Africa, particularly Nigeria. We are looking for committed and ambitious founders with technology solutions that have gained some traction, generating revenue, addresses a clear need/want and has the potential to scale. You can find more information and apply here. It is important to note that startups will have to work from our incubation space in Lagos, Nigeria for the duration of the program. The revamped program represents a great opportunity for startups with innovative solutions to take advantage of CcHUB’s robust resources and brand to build sustainable businesses.We are super excited and look forward to working with all the startups.